Cosmo Bloor and Jessica Manchester are the series winners! Congratulations. Includes entry to Maraetai forest for the race day and shuttles at Dome Valley race day. 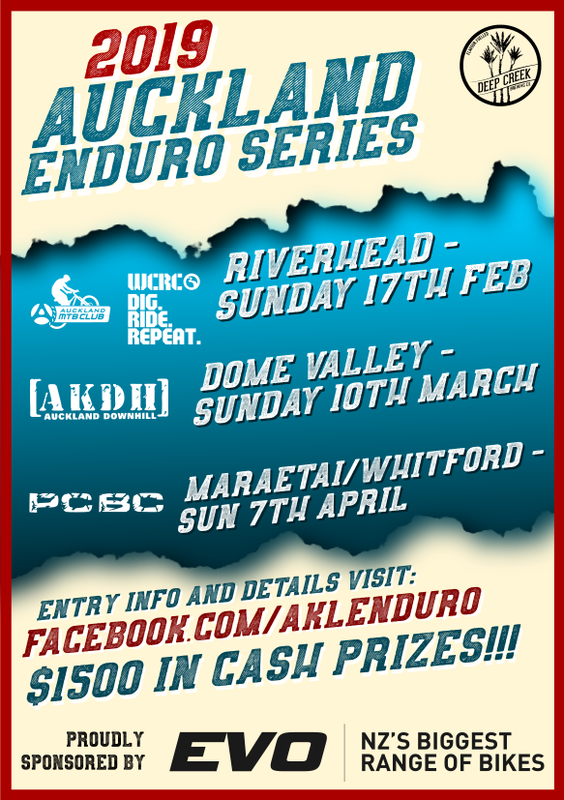 Maraetai and Riverhead will be self-supported event with no shuttle service for the race days. BBQ and/or a food truck on site. Bring your own chilli bin. Enduro: Who, What, When, Where… and Why? Whether you are an MTB racer or weekend warrior, there is one term that you have probably heard thrown around a lot over the past few years: Enduro. What is it? Why should you care? We’re here to help. Mountain biking is a dynamic, multi-faceted cycling discipline. Depending on your skill level and where you live, it can mean very different things to different people. Some people prefer a casual pedal down a dirt path or fire road, while others consider flying down post ski-season resort mountains their cup-of-tea. And most of us… we fall somewhere in the middle, enjoying the spectrum of what mountain biking has to offer. So, what is enduro, anyways? Enduro is a form of mountain bike racing, but you will also hear “enduro” used as an adjective to describe a certain trail, bike, piece of mountain biking equipment or clothing. When used as an adjective, the person is comparing what he/she is talking about to something that you would see or find in an enduro racing event. Enduro mountain bike racing started out in Europe with influence from car rally racing and motorbike enduro racing. The concept was simple: get yourself to the top of a mountain and race to the bottom time-trial style. In general, modern enduro races involve anywhere from 3-6 timed stages. The timed portions of the race are mostly downhill but can vary in steepness, length, and difficulty depending on location. Between each stage, there will be untimed “transfer stages” that are mostly uphill. Depending on the race, transfer stages can involve good old-fashioned pedalling. Enduro combines elements of all racing disciplines from the physical fitness necessary for cross-country racing, the mental stamina necessary for XC-style stage races and the bike-handling skills to navigate technical gravity-fed singletrack. But for the most part, enduro is meant to be a fun, approachable and exciting form of mountain biking. All the clubs are nonprofit organizations and run by a team of dedicated volunteers who love everything MTB but we need your help to pull off these events we run, please email events@aucklandmtb.co.nz to offer your support at one venue or all 3 if you have the time. We will provide lunch to keep you going and you will be included in the spot prize draw. See https://www.facebook.com/aklenduro for more info.